I've spent a good part of last week and the weekend learning and playing a couple games of Warmachine/Hordes while I also budget time to finish up for Midwest Rampage. After scoffing for so long at Warmachine as just another game, I finally broadened my horizons after getting a free starter box at Adepticon... and I REALLY liked it. Privateer Press really did the job right with the Adepticon swag bags, the models are top notch and really perked my interest. A week after assembling my first models I now have a formidable force and I am ready to start learning and hitting up tournaments. 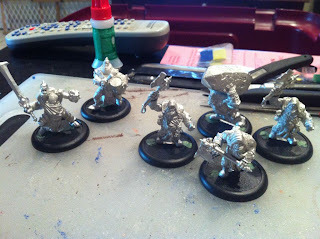 First batch of Trollbloods, adding to my starter. Reinforcements arrive after my first couple of games and friendly advice. 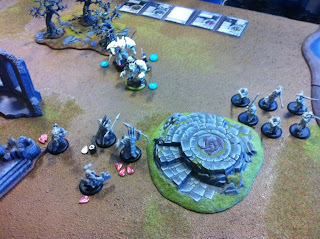 I played two games of WarmaHordes this weekend up at Gamers Sanctuary. 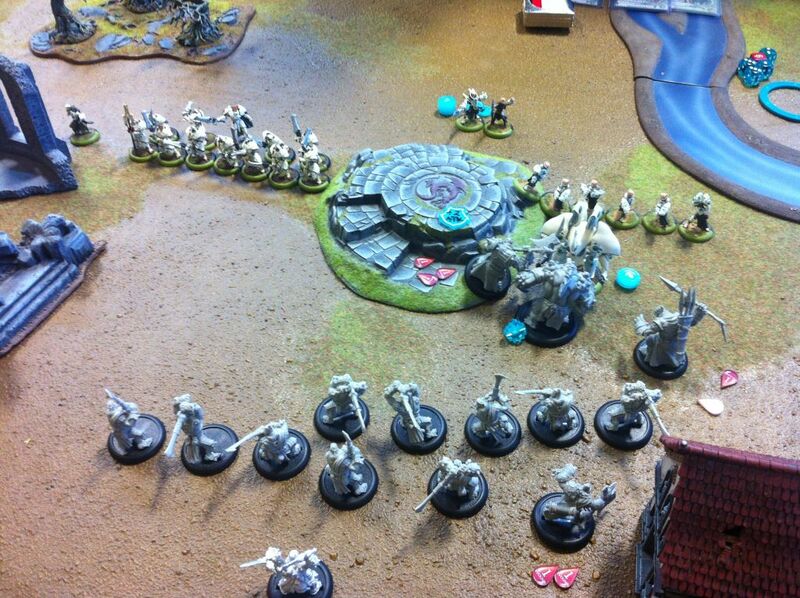 Both games were against Retribution lists from Warmachine. The first game my opponent took his "weaker" caster (not that I know the difference) and I think I more or less overwhelmed him with numbers. He took 2 big warjacks, and I had 3 light warbeasts and a unit. The game was fun as my unit flanked to support and was able to work my way towards his Warcaster. Game 2 was more of a learning experience as we jumped from 15 to 25 points. There was a lot more going on and I got pummeled! Up until the end of the game that is, when my only remaining model (my Warlock) retreated behind a building on my end. The Retribution force tried to swarm after me but failed to finish me off after leaving his Warcaster out in the open to cast his final spells. Down to my very last hit point with 1 Fury, I charged his caster and hit twice and rolled near max damage both times to kill and STEAL the game away. It was very fun learning and playing a couple of games, and I definitely see myself getting excited to build and paint a tournament army for Warmachine. I just don't have time right now, because I still have models to paint for Midwest Rampage!!! I put some good work in on that front this weekend. 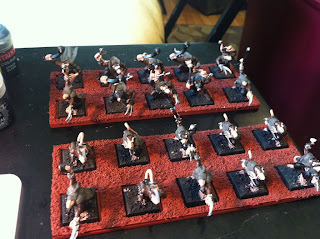 My movement trays were primed and ready for paint, and my Gutter Runners are tabletop ready at least after a good painting session all day yesterday. 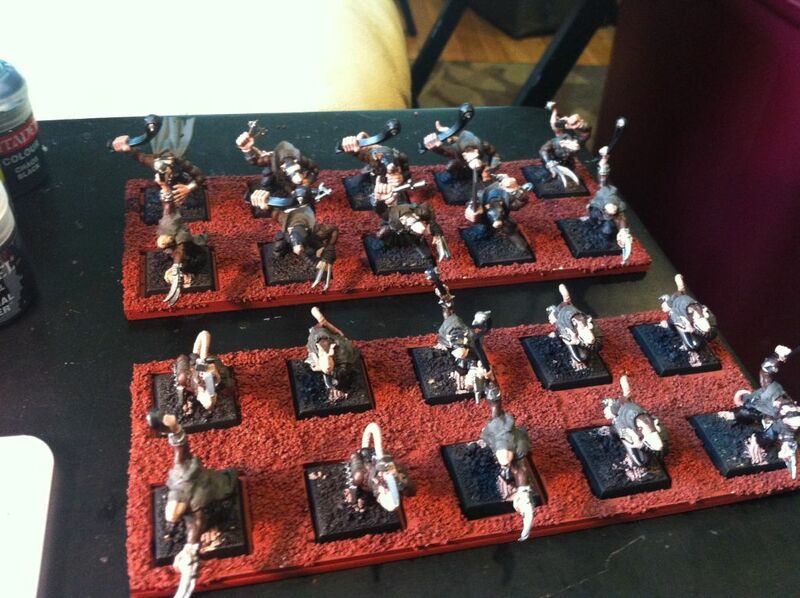 In progress shot of Gutter Runners after the basecoat on the new skirmish trays. I also primed the Watchtower terrain set. The plan is to paint up the buildings and base and paint the top of the display board. The "village" above ground will also be marched on by Skaven as my board will be above AND below ground... so I can fit all 3000 points! 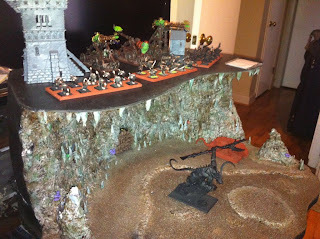 With my Gutter Runners at least tabletop ready, I can now make sure I have time for what I have left to paint in the next week and a half: Plagueclaw Catapult crew, movement trays, display base painting, Watchtower painting, and 2 alternate Hellpit Abominations saved for last, because I don't NEED them to be finished in time. I have a feeling they won't be making the trip, though. Glad you enjoyed WM/H. I really like it as an occasional alternate to 40k and WHF. That display board is boss! 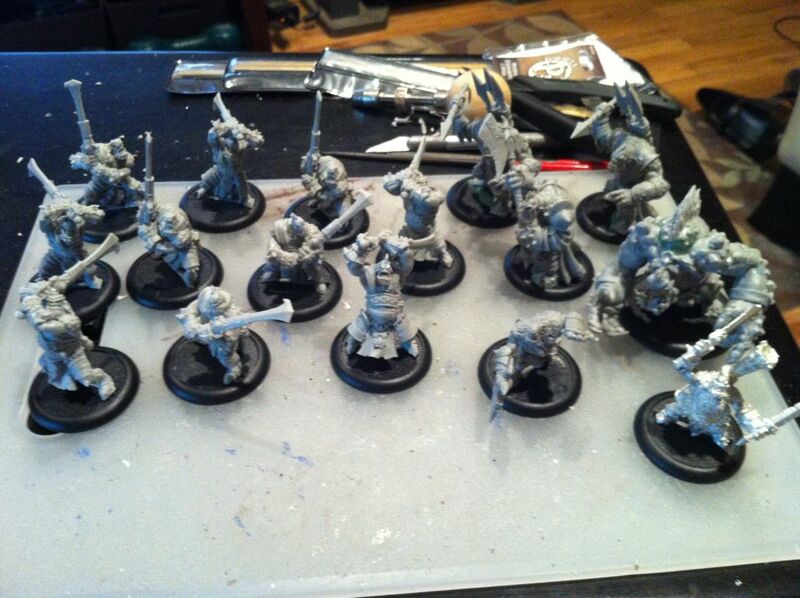 I saw all your tweets about getting into Warmachine so I thought I would check it out as well. Got a pick up game this Monday and by Wednesday had 2 Warlocks, 3 Heavy Warbeasts and 2 light Warbeasts for my Circle army. I too am really enjoying the game and I am really looking forward to painting up the wolves!! From what I've been reading and seeing, UNITS are a very strong part of the game. I've got the unit of Fennblades, picked up a Krielstone unit, and just ordered a Long Rider unit which seems to be a pretty tough unit. The tough part for me will be reading up on and learning all the different faction, and all the different casters within each faction. It's a LOT to learn.